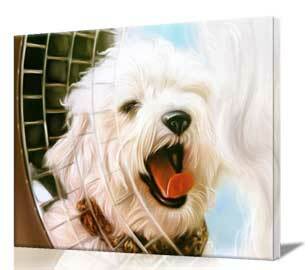 Let one of our professional Artists turn your favorite Dog photo into a painting on canvas. 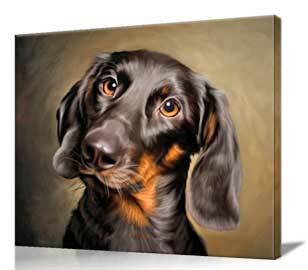 Order our $10 preview and we'll show you a preview of your Dog portrait hand painted in the style of Traditional Oil. 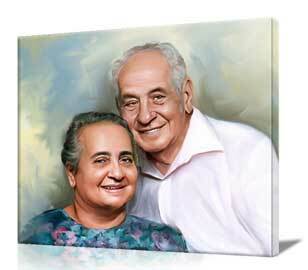 You'll be able to view the portrait, make changes & decide afterwards whether to buy. Cost for the finished artwork starts under $150. Great remembrance gift. into a Black and White Charcoal sketch. thats close up with good lighting. Gift Card holders: enter code at checkout. Get an email proof to approve. We've been creating custom hand painted Dog portraits since 2005. 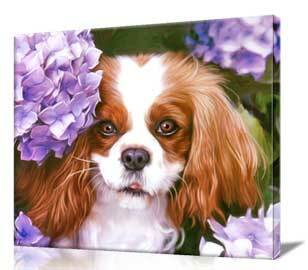 Whether we print your favorite Dog photo on canvas with gallery wrap or create a Dog painting from a photo....we guarantee your complete satisfaction. Our goal is to create a beautiful Dog Portrait you might cherish forever. The Dog paintings seen here are hand painted using a digital process. This allows us to paint faster, more accurately and accept commissions at a lower price. "The portrait of our Dog "Kingsley" came out beautiful. It was even better in person than on your website. Kingsley was a King Charles Cavalier and he meant so much to us. This past week was the anniversary of his passing. This painting will remind us of him forever. God bless." "You turned this photo of Emily and our Dog Bentley into such a wonderful portrait. 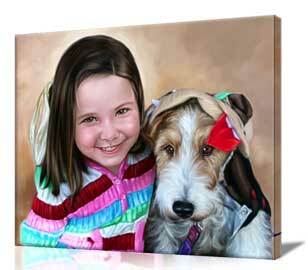 The canvas is just what we wanted to remember our beautiful Grandaughter and her Dog together in one artwork. Your art service is everything the website said it would be. xoxoxo from all of us!" "Barney struck this curious pose one day and its always been our favorite photo. You did a Dog portrait for one of our neighbors and we've always admired it. Now we have our own and couldn't be happier. You'll definitely be recommended to others!" 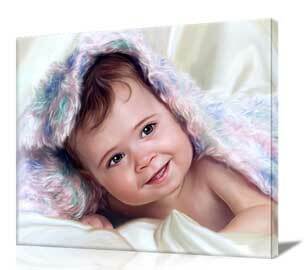 "We liked the portrait of our Dog Dexter so much we ordered a second painting of our Daughter. What I liked the most was seeing the draft first to check it out. You did everything and more with the photo we sent you. 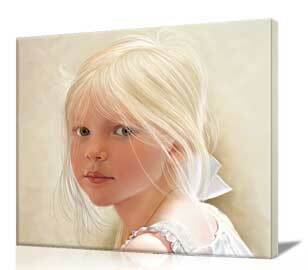 This portrait of Chloe will hang in our home forever." "Just a note to say thanks. Our poodle dog painting came out wonderful and has breathtaking colors. If you want to use our dog portrait as a sample please do so. Everyone should know about what you guys do. Very good value for the cost and we thank you again. We'll be back for sure." "You don't know what this means to us. Our Grandparents we're married for 50 years so giving them this gift on their Anniversary was truly something special. We love this portrait you made for us as much as the first one with our Dogs!" 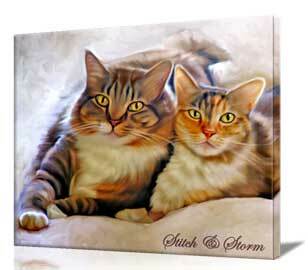 "The Dog portrait was great and now we have two paintings from you. Haha, we're art collectors! 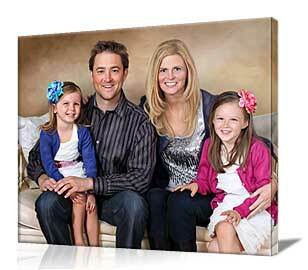 Yes of course you can use our portraits on the website. Thank you again for a professional service and quick delivery. Will be posting on facebook about you so friends can see the lovely artworks." "So here is "Stich" and "Storm" our two Cats. I thought at first you only made portraits of Dogs but of course you can probably do any animal. The photo we sent was pretty dark and blurry. The painting so much brighter and colorful. Good eye for details folks. Count us as a happy customer." "For the first seven years our two Dogs we're our kids. They went everywhere with us, camping, the beach, etc. The painted portrait you made still hangs in our home. Now, our baby is here and this portrait is as special as she is. Wonderful family memories and we thank you." A painted Dog, Pet or family portrait used to be something only the wealthy could afford. But now you can give the gift of Art right here. Gift certificates are sent from our website directly to your recipient within minutes. Or you can send the certificate to yourself for printing on your own computer and then hand the paper copy to your loved one. Our gift certificates can be used to print a favorite photo on canvas, create a painted Dog Portrait or restore an old or damaged photo. We believe in supporting the communities we serve. If you're planning an event to raise funds for a dog rescue, school, church or anything else worthwhile in your community....just let us know. We'll try to help if we can. Be sure to explain your fundraising campaign so we can understand what your goals are. For those campaigns we can verify...we'll try to support you in your fundraising efforts. Our Affiliates earn up to 20% ! Most sites on the internet offer affiliate commissions between 10 to 15%. We think you deserve more. We offer a more generous rate since your hard work and reputation that brought the customer in. Yes, we accept inquiries from qualified resellers who want to sell our product in a physical store. We offer displays, sales literature and incentives to help you get started and attract interest in our affordable Art services. Give us a call to learn more.